This chili is such a hearty, winter comfort food. Its also loaded with veggies, beans and poultry so your fiber and protein intake for the day will definitely be met and you'll stay full after eating just a small bowl (but if you want seconds you can go for it without feeling guilty). Kabocha squash is one of my favorite winter squash. Its relatively new in America. Also known as a Chinese pumpkin, the kabocha obviously made its way hear from Asia and we're still figuring it out. Its sweet and has a starchier texture than butternut squash, but isn't nearly as calorically dense as a similarly starchy sweet potato. If you can't find a kabocha, butternut squash will work just as well in this recipe (although you'll have to cut the alliteration in this dish's title short). When I made this chili I had a bunch of shitaki mushroom stems preserved in the freezer. I've read that the stems of shitakis, though too woody to eat, can add a great earthy flavor to vegetable stock. Instead of going through the process of making a whole pot of stock, I packed the stems into a pouch fashioned out of cheesecloth and threw the pouch in the chili pot. I can't say for sure if the stems made a difference in this chili because I haven't made this without them yet. However, saving the stems in the freezer and throwing them in is easy enough that I'd always rather do it than have those possibly valuable flavors go down the garbage disposal. 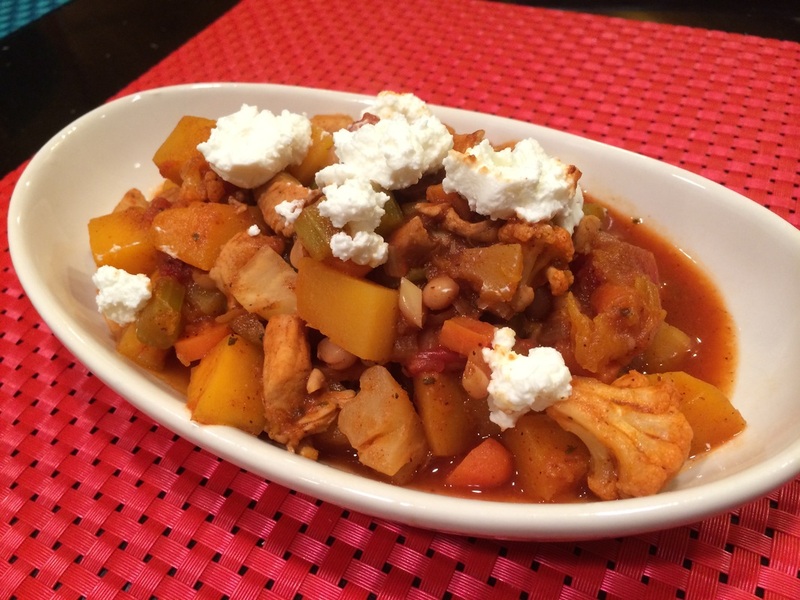 I like to serve this chili with creamy crumbles of greek yogurt cheese. Make this recipe vegetarian by simply omitting the chicken. Really, its got enough other stuff to survive the loss. To heft it up a bit, add another can of your favorite beans. Chick peas would be a great addition. Make this recipe paleo by leaving out the Greek Yogurt Cheese crumbles. Brown chicken in a lightly greased large pot over medium heat until all surfaces are opaque. Add all other ingredients (except for the greek yogurt cheese) into the pot. Bring to a boil then reduce to a simmer. Cook over low heat for 2 hours or until all veggies are tender to your liking. Remove the shitaki mushroom stems. Serve with crumbles of greek yogurt cheese or a dollop of sour cream on top.